I finished the prototype Origami Top the other day and am now happily wearing it both around the house and even in public. I made a few modifications to make it more wearable – small tucks all the way around the perimeter so that it didn’t tent as much and bias binding around the cuffs for a more finished look. If/when I make this again, I’d go just a bit smaller (my original square, minus seam allowance was 18″) and the neck opening could use some modification as well. But, it’s an interesting and flattering garment that clearly makes good use of handwoven fabrics. Pictures will have to wait until I get some help. Selfies just aren’t gonna cut it. 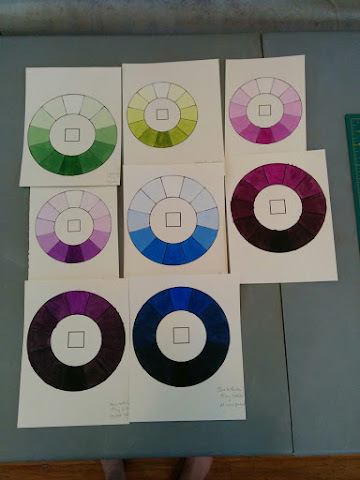 I’m also still busily mixing colors and painting away on color wheel templates. First was a straight-up exercise in value, going from white to black. 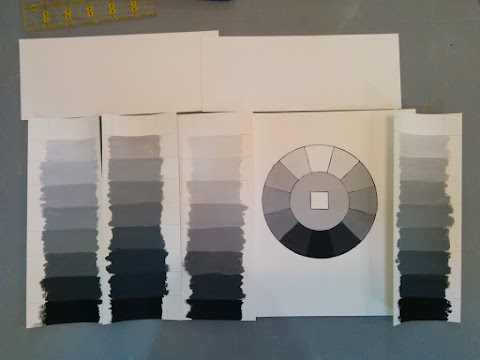 You can see how my ability to hit the very light grays improved over time (second from the left was my first try; total fail) and the eventual value wheel that came of it. The strips got trimmed so that the edges are clean. I’ll save all of them because they’re good for showing progress as well as for comparing values. I still need to do yellow/orange, but otherwise this portion of the wheel is done. Part of the fun of this exercise is seeing how black affects the hue. I’d learned some of this through the dyeing I’ve done and the way yellow becomes green never ceases to amaze me. And the browns that come from adding black to orange is also quite compelling. Lots still to do – blue/green and blue/purple haven’t been started and I think the purple to black needs revisiting. 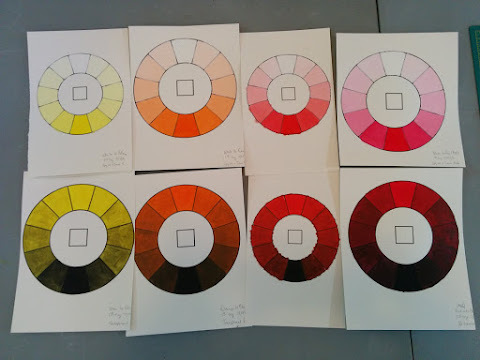 Starting from a low-intensity color and moving toward black is really challenging. Lighting in the studio isn’t as good as it could be and, interestingly, the reflection off the wet paint/white palette is also rather disruptive. That said, I continue to get better the more I do this and each of them is useful in it’s own way. They’ll all go into notebooks for later reference. And, having homework has been great for ensuring I’m constantly making progress. There’s another deadline looming in the background – the Fall submission for my Complex Weaver’s study group. I really want to do something based on the hemp fabrics I sampled earlier this summer and I also have my handspun Dornick Twill fabric that needs making up. Marrying structure/design to a garment is a challenge that I really enjoy and letting it just percolate in the background while I work on my color mixing is a nice way to make progress on both fronts. That said, I’ve got just about five weeks to get it done and I lose about 10 days due to traveling and other things; so, this week I need to make a decision and go. Maybe a run will help settle things. I love origami. It’s not something I do often, or that I’m good at, but the planning and ingenuity of being able to think through the folds is endlessly fascinating. It’s a skill that I could stand to improve because it’d also improve my sewing ability. There’s a lot of crossover between planning a turn of fabric to miter a corner and making the neck of a crane. So you can imagine how intrigued I am by the Origami Shirt pattern that was originally published in the March/April 1995 issue of Handwoven. It’s deceptively simple – a single piece of cloth, 1 x 6, that is cut, resewn and folded to make a bias-cut long sleeve top. It’s a truly charming notion – one that’s been simmering in my head for quite some time. I attempted to make a muslin about a year ago that failed miserably, mainly because I was (as usual) rushing my way through and I made an unrecoverable cutting error. I also quickly realized that seam allowances hadn’t been added into the pattern and my skills just weren’t up to dealing with that. Yet. It got unceremoniously chucked into the bin and into the back corners of my brain. Earlier this month, while getting ready to head back to Wisconsin for a vacation with friends, I decided it was time to tackle this project again. But this time, I’m thinking it through. 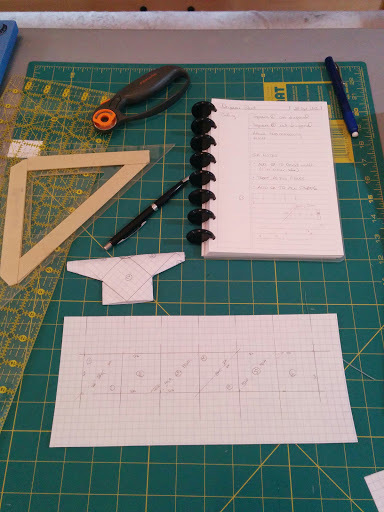 There’s a little paper mockup so that I can see how it all fits together, a few notes on laying out the pattern and now I’ve got a plan. Just to be sure, I’m making a paper copy, first. And, in the mean time, I’m sizing some yarn. Because if you’re gonna make an origami top, you use handspun fabric.